When I was in India, I had an aversion towards Pork and never dared to try it. The very sight of Pork Fat often made me run from the kitchen. After coming to US, I tasted Pork Fry from a cousin’s place and was surprised that it tasted almost like Beef. I became accustomed to the taste of Pork and now I prepare it once in a while. 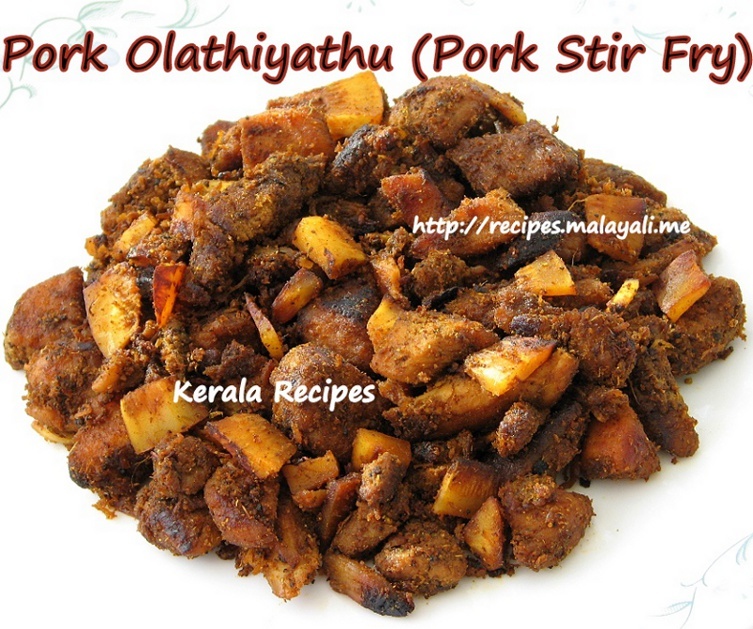 Pork Stir Fry (Olathiyathu) is made similar to Beef Fry (Olathiyathu) except that more Vinegar and Black Pepper Powder is used for Pork. I mostly use Lean Cut Pork but you can prepare this dish with any fatty cut of Pork. Wash the pork thoroughly and drain all water. Dice it into bite sized pieces. Marinate the pork with all the above ingredients and keep it aside for 30 minutes. Cover and cook the pork in a big pan until it is 70% cooked. You don’t have to add water while cooking the pork as it will let out water by itself. Heat 3 tbsp oil in a big non stick pan or wok and splutter mustard seeds. Saute onions/shallots, green chillies and curry leaves until the onions become translucent. Reduce heat and add little salt, 1 tbsp meat masala powder, 1 tsp garam masala powder, 2 tsp coriander powder and 1 tsp black pepper powder. Saute for 2 minutes. Transfer the cooked meat along with any remaining gravy to the above pan. Continue stir frying the pork so that the gravy evaporates and the masala gets coated on the meat. Sprinkle 1/2 tsp pepper powder at this stage. Roast the meat on medium low heat for 10-15 minutes till it is completely dry and turns into a dark brown color. The longer you stir fry, the better it tastes.You can add more oil while stir frying to prevent the meat from sticking on to the pan. If you are using Pork which has Fat, then you need to use very little oil for stir frying. Yummy recipe. I tried it & it was a huge hit with my family. I never thought I could make Pork but this came out so well. My whole family loved it. Thank you! Thank you Jisha for sharing these wonderful recipes.